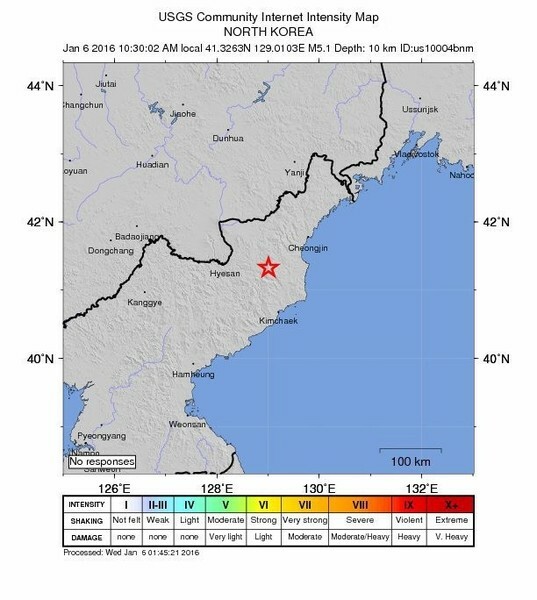 The US Geological Survey reported a 5.1 magnitude quake that South Korea said was 30 miles from the Punggye-ri site where the North has conducted nuclear tests in the past. South Korean intelligence officials and several analysts questioned whether the explosion was indeed a full-fledged test of a hydrogen device. "Given the scale, it is hard to believe this is a real hydrogen bomb," said Yang Uk, a senior research fellow at the Korea Defence and Security Forum. "They could have tested some middle stage kind (of device) between an A-bomb and H-bomb, but unless they come up with any clear evidence, it is difficult to trust their claim." We absolutely cannot allow this, and condemn it strongly. The White House says it cannot confirm the test, but would condemn it if verified. The UN Security Council will meet later today to discuss the announcement. The IndependentThe White House has said it expects North Korea "to abide by its international obligations and commitments" after the isolated Asian nation announced it had successfully tested its first hydrogen bomb. Earthquake sensors worldwide detected a 5.1-magnitude seismic event close to the country’s Punggye-ri nuclear test site at around 10am local time. 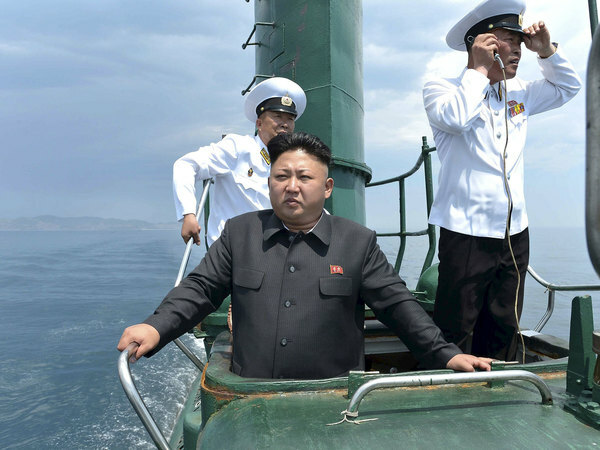 The IndependentAs the world reacts to claims North Korea has successfully launched a hydrogen bomb, it has emerged Pyongyang’s previous test included the launch of a ballistic missile from a submarine. 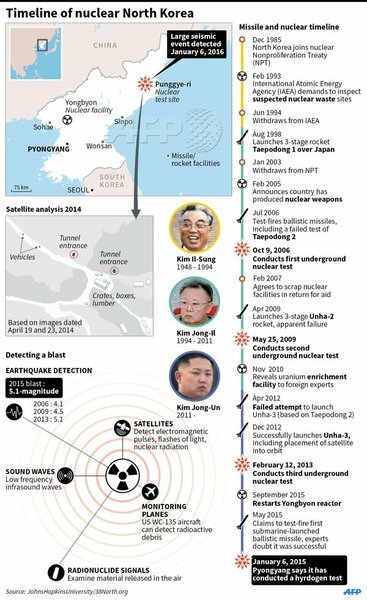 The chilling revelations appear to show the hermit state is simultaneously working to build both a viable nuclear bomb and a practical method by which an atomic warhead could be launched. The Foreign Secretary, Philip Hammond, is visiting Beijing today and has discussed the test with his Chinese counterpart. "If a nuclear device has been detonated by North Korea, this is a grave breach of UN Security Council resolutions and a provocation which I condemn without reservation. It underlines the very real threat that North Korea represents to regional and international security. We will be working with other UN Security Council members to ensure the international community responds urgently and decisively to this latest activity." Countries around the world are condemning the test. China, North Korea's strongest ally, said it was carried out in defiance of the international community and urged Pyongyang to refrain from acts that might worsen tensions on the Korean Peninsula. Australian Foreign Minister Julie Bishop said the action "confirms North Korea's status as a rogue state and a continuing threat to international peace and security." Meanwhile, the French President, Francois Hollande, said that "France condemns this unacceptable violation of Security Council resolutions and calls for a strong reaction from the international community." The IndependentNorth Korean state television has released a statement on their claims to have successfully carried out a hydrogen bomb test. 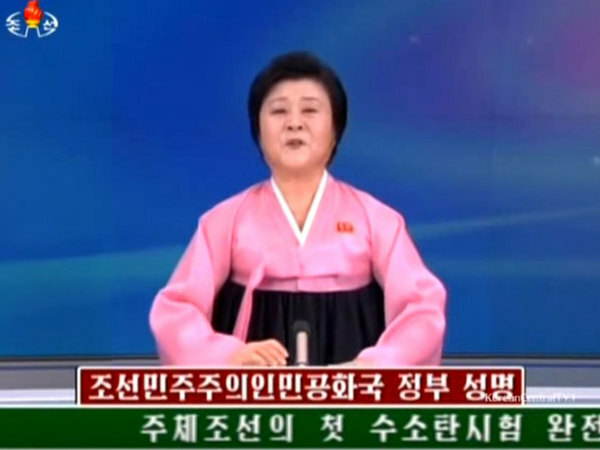 Speaking on Korean Central Television, the dictatorship’s official news channel, a visibly excited news reader announces to the news to the country. The test has not been independently verified and experts have raised doubts over North Korea's ability to develop a minaturised H-bomb, saying the device may have been a less powerful atomic bomb. The United Nations body that monitors signs of nuclear testing says it had detected "an unusual event in the Korean Peninsula." Readings placed the epicenter at North Korea's Pyunggye-ri nuclear testing site, where previous experiments have been carried out. A tremor in the vicinity registered at 5.1 on the Richter scale, according to the US Geological Survey. 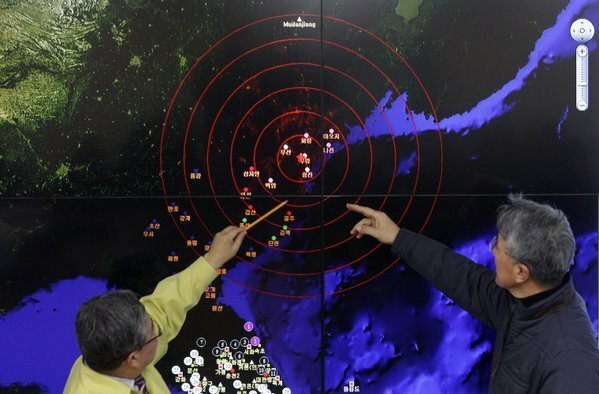 South Korea's National Intelligence Service has reportedly claimed that the seismic wave generated by the suspected test was too small to have come from a hydrogen bomb. Intelligence committee member Lee Cheol Woo told the Associated Press that an estimated explosive yield of six kilotons and a quake with a magnitude of 4.8 were detected - smaller than the estimated explosive yield of 7.9 kilotons and 4.9 quake reported after the 2013 nuclear test, and only a fraction of a typical successful hydrogen bomb test's explosive yield of hundreds of kilotons. The IndependentExperts have expressed scepticism over North Korea’s claims to have successfully conducted the country's first H-bomb test. 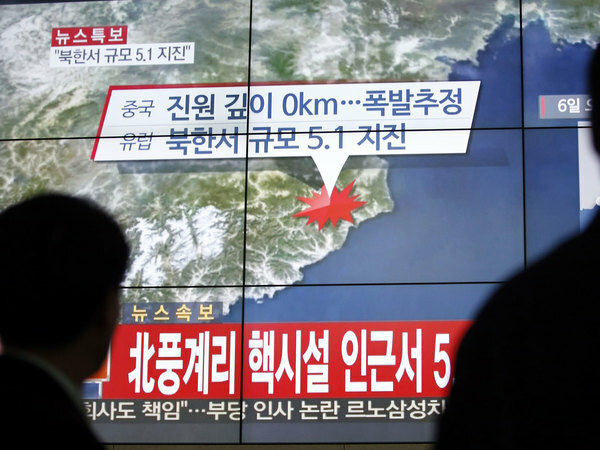 The country said that it completed its first test today, prompting panic in Japan and South Korea amid security concerns. 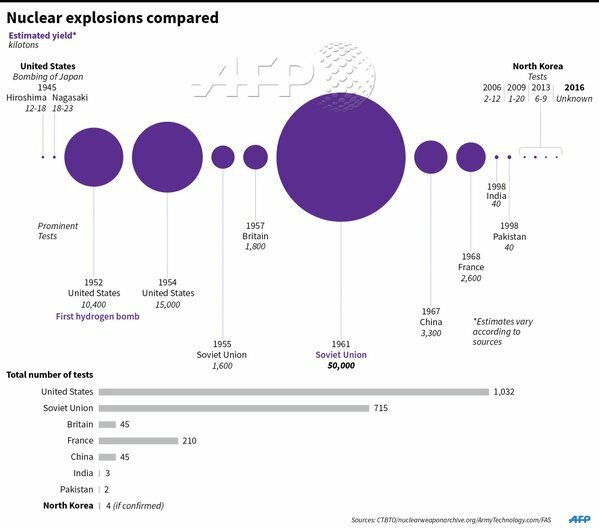 As the graphic below shows, the US has carried out the world's largest number of known nuclear tests, followed by the former Soviet Union, France, China and Britain. The data is difficult to verify but appears to show North Korea's tested weapons are far less powerful than those of its rivals. Pyongyang has framed its nuclear weapons development as self-defence, saying in today's statement that "it is the legitimate right of a sovereign state for self-defense" and calling itself a "responsible nuclear weapons state". The IndependentA North Korean human rights activist has hit out at Westerners for laughing at Kim Jong-un instead of treating him like a “murderer”. Yeonmi Park, 22, escaped the totalitarian regime with her family when she was 13 and now campaigns against the alleged human rights abuses taking place under Kim’s dictatorship. Federica Mogherini, the European Union's high representative for security, has said that if confirmed, the test “represents a grave violation of the DPRK's international obligations not to produce or test nuclear weapons”. Citing United Nations Security Council Resolutions, she said the move was a “threat to the peace and security of the entire North East Asia region”. I call on the DPRK to re-engage in a credible and meaningful dialogue with the international community, in particular in the framework of the Six-Party Talks, and to cease this illegal and dangerous behaviour. I will speak this morning with the Foreign Minister of the Republic of Korea Yun Byung-se and the Foreign Minister of Japan Fumio Kishida to discuss the way forward. We will work with the UN Security Council, which will meet later today in urgent session to address this issue. The International Atomic Energy Agency (IAEA) has also condemned the test. Director General Yukiya Amano said it would be "in clear violation of UN Security Council resolutions and is deeply regrettable". I strongly urge the DPRK to implement fully all relevant resolutions of the UN Security Council and the IAEA. The IAEA remains ready to contribute to the peaceful resolution of the DPRK nuclear issue by resuming its nuclear verification activities in the DPRK once a political agreement is reached among countries concerned. The IndependentNorth Korea claims it has successfully tested an “H-bomb of justice” that could be loaded on to a missile, spreading shockwaves around the world. The country’s state news agency KCNA said Kim Jong-un ordered the test at 10am local time on Wednesday (1.30am GMT) as part of the “all-out charge to bring earlier the final victory of the revolutionary cause of Juche (North Korean ideology)”. Russia has now joined countries condemning the claimed test, which the Foreign Ministry said had not been confirmed. In a statement, the ministry called on "all interested sides to preserve maximum restraint and to not take actions that could rouse the uncontrolled growth of tensions in Northeast Asia." Some experts, including intelligence officials in South Korea, have claimed the test carried out was on an atomic bomb, not hydrogen bomb, because of the seize of the blast. Both atomic bombs and hydrogen bombs are kinds of nuclear bombs, meaning that the energy comes from nuclear reactions, Andrew Griffin writes. But the way that they actually release that huge amount of energy is different — and leads to massive differences in the power that is unleashed when they are set off. 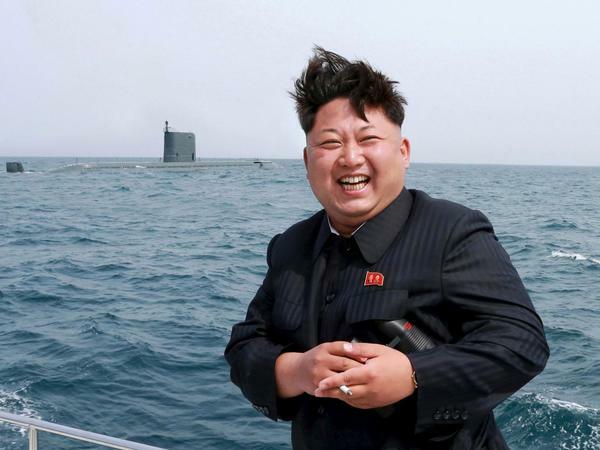 The IndependentNorth Korea has announced that it has tested a hydrogen bomb for the first time. It has run nuclear tests in the past — but the international reaction has been much more panicked this time than before. Both atomic bombs and hydrogen bombs are kinds of nuclear bombs, meaning that the energy comes from nuclear reactions. But the way that they actually release that huge amount of energy is different — and leads to massive differences in the power that is unleashed when they are set off. The President of South Korea has convened an emergency national security council meeting over the reported test. Ms Park ordered the military to bolster its combined defense with the US while the bast claims are analysed. 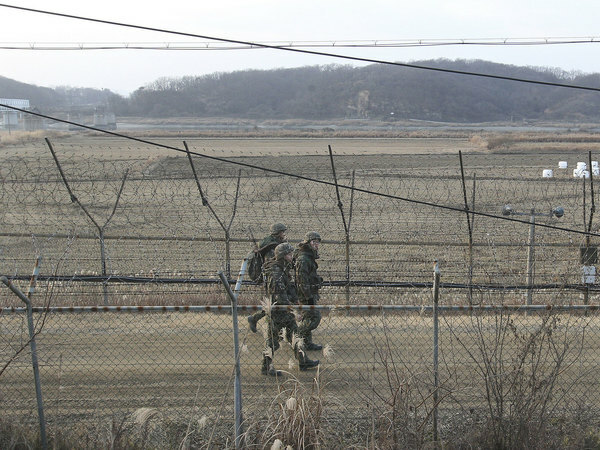 Meanwhile, photos shows South Korean troops continuing to patrol the border between it and its northern neighbour along the demilitarised zone. The IndependentPhotos of apocalyptic explosions and huge mushroom clouds being shared online following North Korea’s claim to have tested a hydrogen bomb actually show experiments carried out by other countries, it has emerged. State media has not released any images of the test itself, which is believed to have taken place in an underground facility, but said it was carried out in a “safe and perfect manner”. Jens Stoltenberg, the Nato Secretary general, has said North Korea's nuclear weapons test "undermines regional and international security and is in clear breach of UN Security Council resolutions". I condemn the continued development by North Korea of nuclear weapons and ballistic missile programmes and its inflammatory and threatening rhetoric. I call on North Korea to fully respect its international obligations and commitments. North Korea should abandon nuclear weapons and existing nuclear and ballistic missile programmes in a complete, verifiable and irreversible manner, and engage in credible and authentic talks on denuclearisation. The nuclear test is expected to be raised during the current session of Prime Minister's Question Time, although the debate is being dominated by flooding at the moment. Hilary Benn, the shadow Foreign Secretary, said earlier that there was still 'uncertainty' about what happened in North Korea but if its claims are verified it would represent "a clear violation of numerous UN Security Council resolutions and I condemn it in the strongest possible terms". "The country's nuclear programme poses a grave threat to international peace and security and does nothing to improve the prospects of the people of North Korea, who continue to pay the price for the country's misguided policies," Mr Benn added. I call on the North Korean government to recognise its commitments under international law, and urge it and the international community to reinvigorate efforts towards the goal of denuclearisation of the Korean peninsula, ideally through the resumption of the six-party talks." The IndependentMany of the world's superpowers could be reached by North Korea's proclaimed hydrogen bomb, according to estimates of the country's firepower. Parts of the US, India, China Russia and Japan could all be reached by the country's missiles, research by Statista has shown. 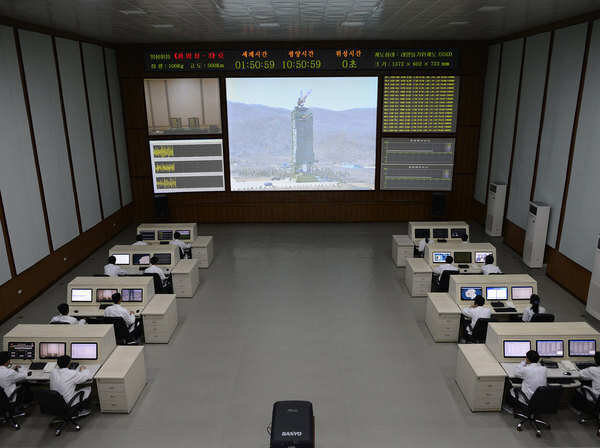 The country is thought to have a range of missiles, including one known as Taepodong-2 that can fire as far as 6,000km. Italy's foreign minister, Paolo Gentiloni, will be calling his Japanese counterpart to discuss 'the necessary reactions' to the test, which he called a 'provocation'. The country's foreign ministry called it "a grave violation of international law and of the pertinent UN. Security Council resolutions and a serious threat to international and regional peace and security." A statement from the foreign ministry said Mr Gentiloni, "in condemning such a violation, calls on North Korea to honor its international obligations." 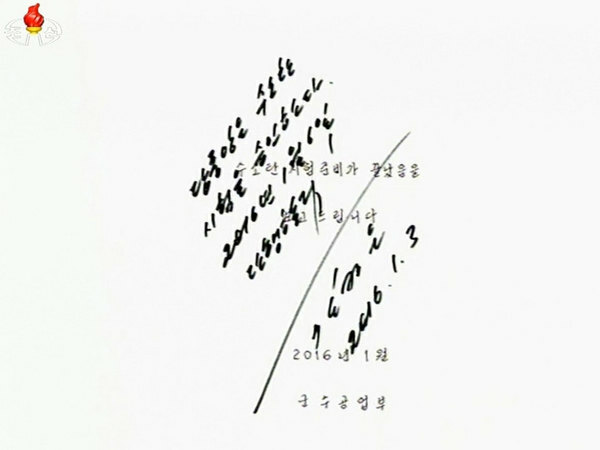 North Korean television said this was the hand-written note from Kim Jong-un granting approval for the test. One translation claims it reads: "I approve the test to safeguard the Party Centre. Carry it out on January 6, 2016. - Jan. 3, 2016, Kim Jong-Un." 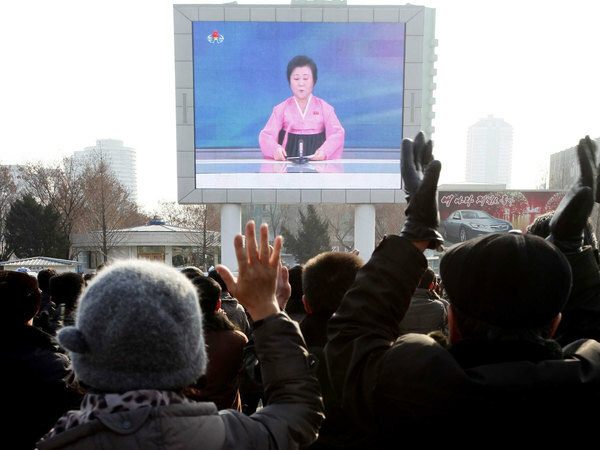 Another quote said the leader wrote: "Let the world look up to the strong, self-reliant nuclear-armed state." As speculation continues over whether North Korea is capable of developing an H-bomb, which experts say would have generated a blast much more powerful than that recorded, plenty of jokes are circulating on Twitter. North Korea develops hydrogen bomb. Seth Rogen's neighbours move out. North Korea detonates hydrogen bomb for Kim Jong-un’s birthday in what was some say was "worst game of pass the parcel ever".
. @dennisrodman Hello, please go ask North Korea to chill. 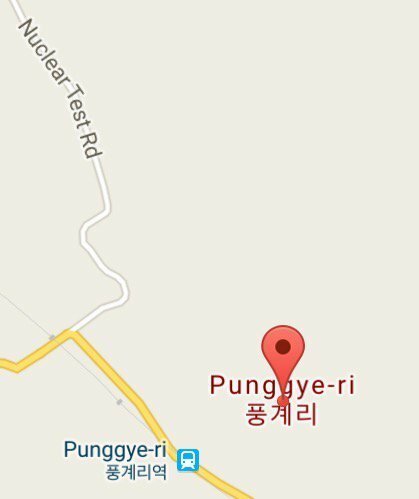 Also, if Google Maps is to be believed, the nuclear testing site in Punggye-ri is helpfully called Nuclear Test Facility and can be found on Nuclear Test Road. 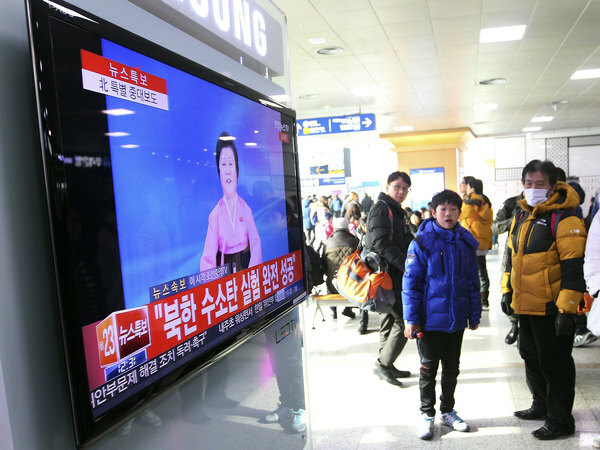 The IndependentNorth Koreans were filmed clapping, cheering and breaking down into overwhelmed tears as they gathered in Pyongyang to watch state media announce the country’s latest nuclear test. Members of the US House of Representatives Intelligence Committee believe it will take several days to evaluate the validity of North Korea's claim that it tested a miniaturised hydrogen nuclear device. Given North Korea's often boastful claims in the past, its assertion that it has mastered the science necessary for a thermonuclear explosion cannot be accepted uncritically." The American government, singled out repeatedly for insults and jibes in propaganda from Pyongyang, has been relatively cautious in its response so far. Paul Ryan, speaker of the House of Representatives, said it was too soon to push for a US response until the facts of the incident are known. "I think this means we have to have a well-honed response with our allies on this rogue regime," he added. "We don't know that he facts yet. This looks like a provocation." Some of the Republican Presidential candidates have been having their say on the issue today in the US. Among them was Donald Trump, who claimed China "should solve that problem" or risk further sanctions by America. Here is part of his statement on Fox News earlier today. There’s this madman over there who probably would use it and nobody talks to him, apart from Dennis Rodman, that’s about it. Nobody is talking to him whatsoever and nobody is discussing it with China. China has total control – believe me they say they don’t but they have total control over North Korea. China should solve that problem, and if they don’t solve the problem we should make trade very difficult for China, because we are holding China up from taking so much money . They’re draining our country and they’re toying with us with North Korea, so North Korea is totally under their control – without China they wouldn’t eat. The UN Secretary-General, Ban Ki-moon, has called the test announcement "deeply troubling". "This test once again violates numerous Security Council resolutions despite the united call by the international community to cease such activities," he continued. It is also a grave contravention of the international norm against nuclear testing. This act is profoundly destabilising for regional security and seriously undermines international non-proliferation efforts. I condemn it unequivocally. I demand the DPRK cease any further nuclear activities and meet its obligations for verifiable denuclearisation." 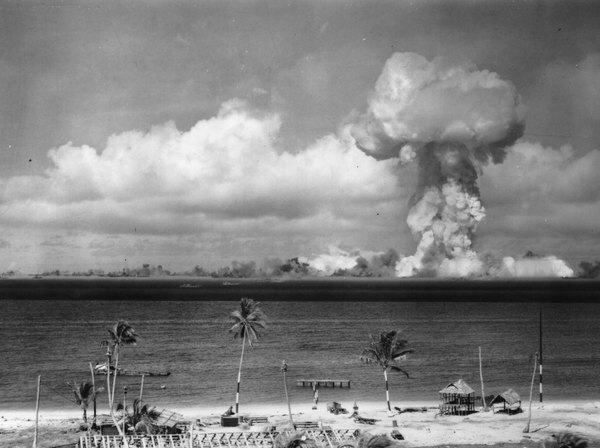 The UN is monitoring and assessing developments as experts attempt to verify the test, alongside international organisations including the Comprehensive Nuclear-Test-Ban Treaty Organisation. 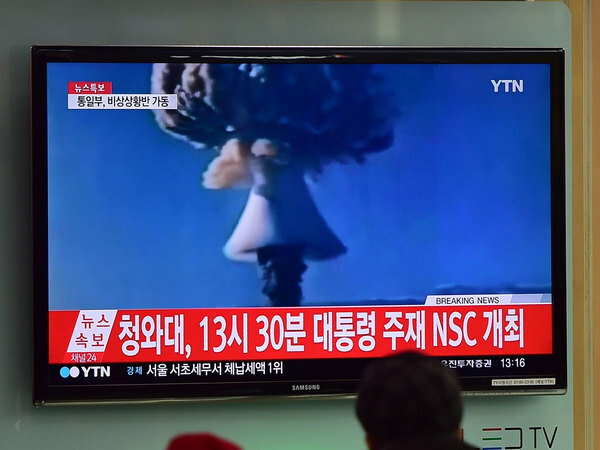 The IndependentThe nuclear testing facility where North Korea claims to have detonated its first hydrogen bomb has been receiving some enthusiastic online reviews. The Punggye-ri Nuclear Test Facility seems surprisingly easy to find on Google Maps, in Nuclear Test Road, North Hamyong. We are now closing today's live blog, thank you to everyone for reading. 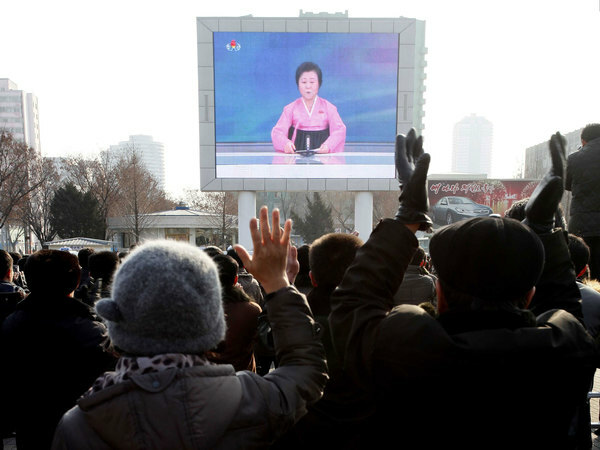 All our latest stories on developments in North Korea will be available on our website.